Update: For Windows 10 (and I assume Windows 8 and above) the Windows Calculator Accesssory cannot be used for this. 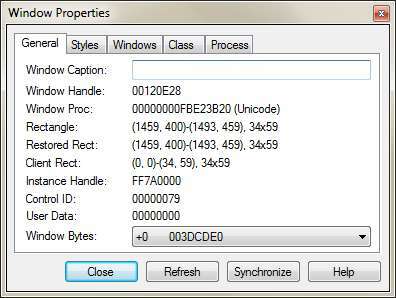 See the modification of the attached sample code necessary for the Windows Character Map Accessory for the ButtonId and fn. This article provides a simple sample of an application that clicks a button in another application. The technique could be used for other controls too. For the purpose of a simple sample the program is a console program. The sample will click the "=" button in the Windows Calculator Acesssory or can click the "Select" button for the Windows Charactrer Map Acesssory. This article was originally dwritten using Windows 7 but the Windows Calculator Acesssory in Windows 10 (and I assume Windows 8 and above) cannot be used in the manner it is used here. The first thing to do is to determine what button to click and the circumstances of when to click it. Execute the Windows Calculator Acesssory or Windows Charactrer Map Acesssory. For the Windows Calculator Acesssory type "2+2=" into it. The result should be 4 of course. Then click the "=" button. Each time "=" is clicked, the value will be increased by 2. So that is something very simple to automate. We can "manually" execute Calculator and type "2+2=" into it. Then when we execute our sample application it can just click the "=" button and we can see the result. For the Windows Charactrer Map Acesssory, we just need to execute it. When the "Select" button is clicked the characer is put into the selected box. We canmove to a different character usign the mouse or keyboard. We can see that the "Select" button is clicked becasue the specified character is put into the selected box. Look for "Contol ID" near the botom of the first (General) tab. It will probably have the value "00000079" for the Windows Calculator Acesssory or "00000067" for the Windows Charactrer Map Acesssory. It is a hexadecimal value. Whatever the value is, it will probably be that value every timne you execute that program. At the Windows API level, controls are often identified by a control id. We can use the Contol ID shown in the Window Properties window in our program. We are ready to write the application. I assume you can create a console application. If your system is 64-bit then you will need to change the "Platform Target" to "x64". The .Net Process class cannot do everything we need it to do when our application is not the same as the other application in terms of bits (32-bits and 64-bits). The "Platform Target" property is in the Build tab of the project's properties. If you need to automate a 32-bit application from a 64-bit application or 64-bit from 32-bit then you can do that but you will need to use the Windows API directly to do the equivalent of what we are using the .Net Process class to do. The GetModule function is shown later in this article. To test the program, first execute Calculator and type in "2+2=". Then execute the sample program. Every time it executes, 2 will be added to the Calculator value.